Very limited stock on site. Derek Dier offers offers fine vintage, used and some modern watches for sale. He is of the world's first internet watch dealers-(since 1998 online). With over 25 years of high grade vintage watch expertise, Derek has sold watches to world dignitaries, the movie industry, noted musicians, actors, writers, artists, fortune 500 CEO's, ultra-elite boutiques and collectors. His timepieces are serviced and ready to wear on your wrist. Derek has written articles regarding watches appearing in numerous magazines, websites and has supplied historic information, photos and pricing, and is published in two Vintage Wristwatch "coffee table" books by Krause Publications. Derek is one of the world's leading vintage watch experts. We are proud to be the supplier of vintage watches to the leads and characters of MAD MEN Season 5 & 6. 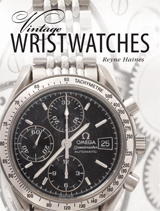 Derek Dier supplied many photographs of lwatches that appear in the two books book above. Click books above to see details. We are members of I.W.J.G. & N.A.W.C.C. Selling your watch? We buy vintage, QUALITY watches... "We pay top... Working or Not!" .